According to Title IV regulations if a student is enrolled in courses that do not count toward his or her degree or certificate, they cannot be used to determine enrollment for federal student aid programs unless they are eligible remedial courses. 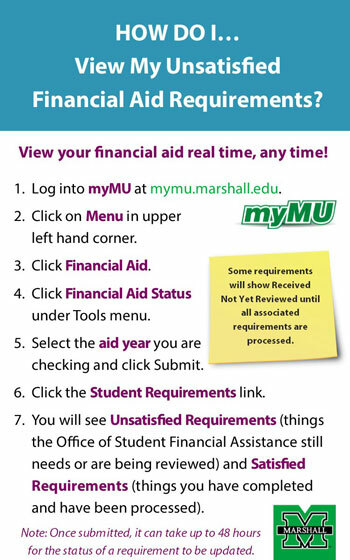 This means that Marshall University may not award a student federal student aid for classes that do not count toward his or her program of study. Graduate students enrolled in 9 or more credits are considered full-time students, and graduate students enrolled in 5 to 8 credits are considered half-time student for financial aid eligibility purposes. As a rule your financial aid package is originally based on full-time enrollment; however, the Office of SFA uses your enrollment status on the first day after drop/add period (usually the 8th day of the semester) to determine your financial aid eligibility. 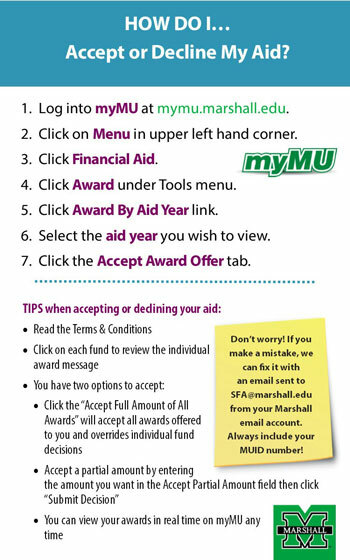 Adjustments to your financial aid awards may be required if you enroll less-than full time. Also, only courses leading to your degree requirements may be included in your enrollment status for Title IV (federal) student aid eligibility. Developmental courses do not count toward the student’s degree requirements; however, students may receive financial aid up to 30 developmental or remedial credits. Developmental course credits in excess of 30 cannot be calculated as enrolled hours for financial aid purposes. Students may receive certain financial aid programs when taking preparatory coursework required for enrollment in a graduate or professional program; however, the course of study to complete the preparatory coursework may not exceed 12 consecutive months. 2. Any repetition of a previously passed course due to the student failing other coursework. Professional staff development courses (560 – 564 S/U or CR/NC series) do not count toward the student’s degree requirements; therefore, they cannot be calculated as enrolled hours for financial aid eligibility purposes. Download a copy of the Financial Aid Tasks and Timeline for 2019 Fall Incoming Class. Download our Federal Work-Study 101 presentation. Been admitted? Check out these Things You Need To Know. How Do I Accept or Decline My Aid? 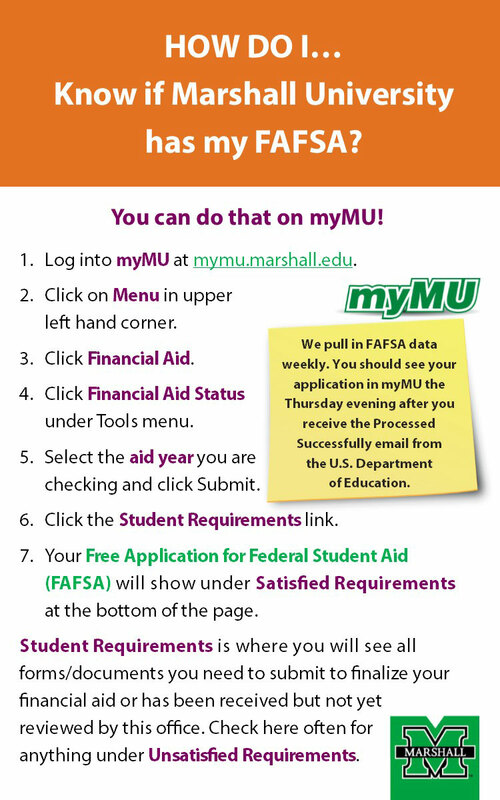 How Do I Know If Marshall University Has My FAFSA? How Do I View My Unsatisfied Financial Aid Requirements? Explore the various merit-based scholarship programs available to assist you in your educational pursuits. Incoming first-time freshmen and transfer students may obtain a quick estimate of your merit-based scholarship eligibility by using Marshall’s Net Price Calculator.